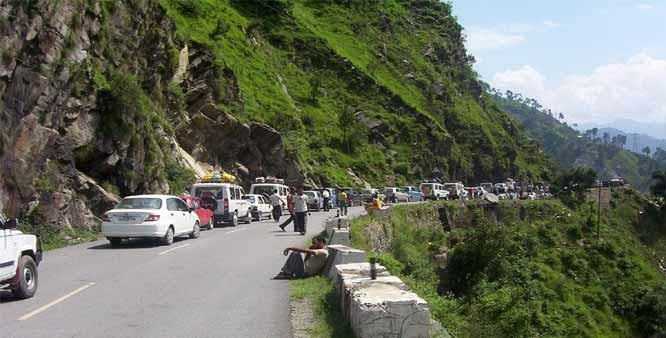 Srinagar: Kashmir highway Monday was through for one-way traffic from winter capital city Jammu to Summer capital city Srinagar. An official said that around 3,000 vehicles, mostly trucks, are stranded. He said that the trucks were unable to cross the Jawahar Tunnel on Sunday evening due to slippery road conditions in Banihal and Lower Munda in Qazigund. Therefore, he said, the vehicular movement was stopped on Sunday evening. For several days landslides in the Ramsoo-Ramban sector and heavy snowfall in Banihal caused the blockade of the highway.